You are here: Home / Food / Do calories matter on keto low carb diets? Do calories matter on keto low carb diets? And, is it important to limit calories for weight loss? Let’s examine the impact of calories when losing weight. People who are trained to counsel people, either through exercise coaching or nutrition, interpret this information as: What you weigh equals how much you eat and how many calories you burn. Or, to put it yet another way, bodyweight equals calories in versus calories out. So, this theory leads one to believe how many calories are needed to lose weight depends on activity level. But is this simple equation accurate? Does it really show the whole picture? 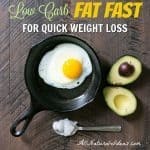 Do calories matter on keto low carb diets when you are trying to lose weight? The answer: Yes! But also, No! In a sense, yes calories do matter when it comes to weight loss. But unequivocally more important is what you eat and how the nutrients that are derived from the foods you eat affect fat metabolism. In essence, how your hormones are functioning, specifically when it comes to regulating fat metabolism is vitally more important than just a total caloric daily value. Let’s use an example of how calories aren’t the most important thing when it comes to weight loss…. If you were to eat only 1,500 calories of white rice versus 2,000 calories of a high-fat/low-carb diet, would you weigh more eating the 1,500 calorie white rice diet? Or would you weigh more eating the 2,000 calorie low-carb diet? Before answering the question, let’s actually go back to the original question: Do calories matter on keto low carb diets? It’s a question that no doubt thousands of people are wondering, just take a look at this Reddit post. In fact, doing a Google search yields hundreds of thousands of results. And, if the question is phrased differently, it’s likely the total is well over a million. Obviously, lots of people are still confused about the connection between total caloric consumption and body weight. But the question everybody should be asking is: before I eat this meal, is everything I’m about to eat going to be stored as body fat? Or is everything I’m about to eat going to help burn my fat reserves? So, when looking at the question do calories matter on ket, in a sense, yes the total amount of calories matters. If you ate 10,000 calories in one sitting of avocados, which is probably impossible. But, let’s just use the argument hypothetically, the law of thermodynamics (calories in versus calories out/burned up) may indeed apply. However, a calorie (technically, kilocalorie is the correct term to measure energy density in a specific food, but we’ll just use calorie here) in one food isn’t the same as a calorie in another food. At least not when it comes to getting leaner and having your pants feel loose on your waist. Only dietary natural fats that have not been oxidized or hydrogenated, and to a lesser extent protein, do not elicit an insulin response. When insulin is released, your body is not using its stored body fat to use energy. It’s putting more sugar in its savings account (your abdominal area) for stored energy. Yes, counting calories can help you lose weight. It’s why programs like Weight Watchers have been so successful. That’s why a lot of people think the answer to “Do calories matter on keto low carb” is yes. But, popular point-counting systems by and large do not place an emphasis on educating consumers on the difference between eating foods that encourage fat storage versus foods that utilize stored body fat. Just how ridiculous the point system is can be illustrated by entering the nutrition info for coconut oil into Weight Watcher’s new point system, which was revised in 2015 to assess a particular food’s total points based on saturated fat, protein, sugar and calories. Let’s say you want to make your own version of Bulletproof Coffee at home and want to use 2 tbsp of coconut oil. That would be a whopping 14 points. Because the points value is ballooned by the saturated fat content (coconut oil has about 12 grams per tbsp), an uneducated consumer would assume that saturated fat encourages fat storage, when it reality, it encourages fat utilization (burning). The perpetuating misinformation about saturated fat is another larger topic. We’ve addressed it in this interview with a nutrition expert here. But the example shows how a calorie in one food isn’t the same as a calorie in another food when it comes to fat burning. And that’s the real takeaway. Conclusion: Do Calories Matter on Keto Low Carb Diets to Lose Weight? Don’t think of it as how many calories are needed to lose weight. This will only burden yourself with calorie counting. Instead, place more emphasis on determining if every food, condiment and drink you consume will encourage the nutrients to store more body fat or burn it. And, the best way to do this is by following a low carb high fat diet. Are you kidding me? You wrote all that to answer the question as to how many calories you should consume to lose weight and then didn’t answer the question. The question was answered. It depends on the macros you get from the food you are eating. 100 calories of healthy fat will react much differently than 100 calories from highly processed high carbohydrate junk food. Many apologies, but I don’t understand. My daily expenditure rate is around 1350 cals/day. I have been eating 1800-2000 cals a day and the macro distribution is fat 75-80%, carbs 5-10%, protein 20-10%… would this kind of eating mean I will gain weight, even when most of my intake is from (good) fat? Thanks for the help! It’s different when in ketosis, but it’s hard to say. It’s best to just experiment and see what works for you. Im frustrated as well because you didnt answer the question. Calories matter. Got it. You can eat more calories on keto diet and because youre eating fat you are satiated and likely eat less calories. All articles state this. But people dont eat because theyre hungry. They eat because they like food. So i was on a high carb diet of 1500 calories a day, how many more calories can I consume on a keto diet? Given i have never seen an answer to this question, im guessing the answer is i dont know because there are no controlled studies on this. And there is the issue. Fat has a lot of calories. So to lose weight, keto may be better but the calories quickly add up. I wish it was more formulaic ie you need a caloric deficit of 3500 calories to lose a pound but on keto you only need a deficit of 1500 calories. Otherwise, might as well count calories as thats proven. There really isn’t a formula and calories don’t seem to matter (unless you go way overboard) when following a ketogenic diet.